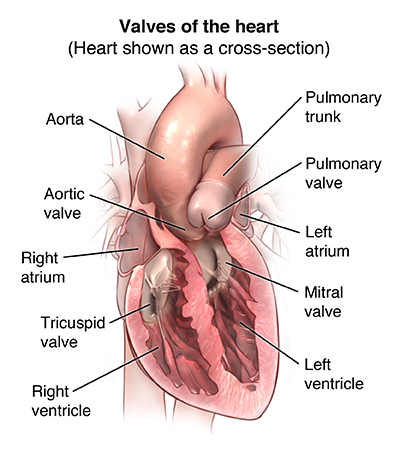 Valvuloplasty may be done to open a stiff (stenotic) heart valve. In valvuloplasty, your doctor inserts a very small, narrow, hollow tube (catheter) into a blood vessel in the groin and advances it through the aorta into the heart. Once the catheter reaches the stiff valve, your doctor inflates a large balloon at the tip of the catheter until the flaps (leaflets) of the valve are pushed opened. Once the valve has been opened, the doctor deflates the balloon and removes the catheter. Why might I need valvuloplasty? 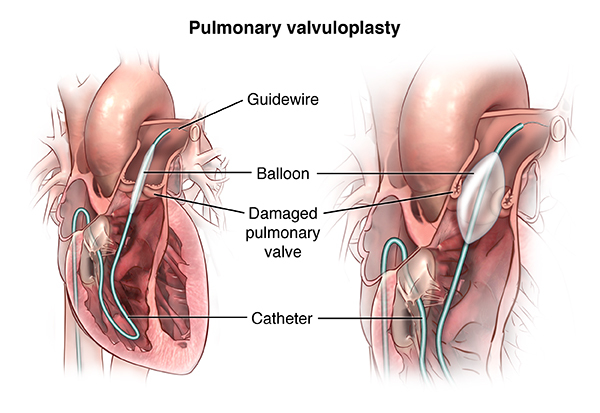 Valvuloplasty may be done to open a heart valve that has become stiff. But, not all conditions in which a heart valve becomes stiff are treatable with valvuloplasty. If the heart valves become damaged or diseased, they may not work properly. Conditions that may cause problems with the heart valves are valvular stenosis (stiffened valve) and valvular regurgitation (leaky valve). When one (or more) valve(s) becomes stiff, the heart muscle must work harder to pump the blood through the valve. Stiff valves may be caused by infection (such as rheumatic fever or staphylococcus infections), birth defects, and aging. If one or more valves become leaky, blood leaks backwards and less blood is pumped in the proper direction. There may be other reasons for your doctor to recommend a valvuloplasty. What are the risks for valvuloplasty? If you are pregnant or think you could be, tell your healthcare provider due to risk of injury to the fetus from a valvuloplasty. Radiation exposure during pregnancy may lead to birth defects. Also tell your provider if you are lactating, or breastfeeding. There is a risk of allergic reaction to the dye. If you are allergic or sensitive to medicines, contrast dyes, iodine, or latex should, tell your doctor. If you have kidney failure or other kidney problems, tell your doctor. Some people may find lying still on the procedure table for the length of the procedure may cause some discomfort or pain. How do I get ready for a valvuloplasty? Tell your doctor if you are sensitive to or are allergic to any medicines, latex, tape, or anesthetic agents (local and general). Tell your doctor if you have any body piercings on your chest or abdomen. Tell your doctor if you have a history of bleeding disorders or if you are taking any anticoagulant (blood-thinning) medicines, aspirin, or other medicines that affect blood clotting. You may need to stop some of these medicines before the procedure. What happens during a valvuloplasty? A valvuloplasty may be done as part of your stay in a hospital. Procedures may vary depending on your condition and your doctor’s practices. Remove any jewelry or other objects that may interfere with the procedure. You may wear your dentures or hearing aids if you use either of these. Change into a hospital gown and empty your bladder before the procedure. A healthcare professional will start an intravenous (IV) line in your hand or arm to inject medicine or give IV fluids, if needed. If there is excessive hair at the catheter insertion site (groin area), it may be shaved off. A healthcare professional will connect you to an electrocardiogram (ECG) to monitor and records the electrical activity of the heart. Your vital signs (heart rate, blood pressure, breathing rate, and oxygenation level) will be monitored during the procedure. There will be several monitor screens in the room, showing your vital signs, the images of the catheter being moved through the body into the heart, and the structures of the heart as your doctor injects the dye. A healthcare professional will check and mark your pulses below the injection site and compare them to pulses after the procedure. Once the local anesthetic has taken effect, your doctor will insert a sheath, or introducer, into the blood vessel. This is a plastic tube through which the catheter will be inserted into the blood vessel and advanced into the heart. Your doctor will insert the valvuloplasty catheter through the sheath into the blood vessel and to the heart. Once the catheter is in place, your doctor will inject contrast dye through the catheter into the valve to look at the area. You may feel some effects when the contrast dye is injected into the IV line. These effects include a flushing sensation, a salty or metallic taste in the mouth, or a brief headache. These effects usually last for a few moments. Tell the doctor if you feel any breathing difficulties, sweating, numbness, itching, chills, nausea or vomiting, or heart palpitations. The doctor will watch the contrast dye injection on a monitor. He or she may ask you to take a deep breath and hold it for a few seconds. Once the balloon is in place and has been inflated, you may notice some dizziness or even brief chest discomfort. This should subside when the balloon is deflated. However, if you notice any severe discomfort or pain, such as chest pain, neck or jaw pain, back pain, arm pain, shortness of breath, or breathing difficulty, tell your doctor. Your doctor may inflate and deflate the balloon several times to open the valve. Once the valve is opened sufficiently, your doctor will remove the catheter. He or she may close the catheter insertion site with a closure device that uses collagen to seal the opening in the artery, by the use of sutures, or by applying manual pressure over the area to keep the blood vessel from bleeding. Your doctor will determine which method is appropriate for your condition. If your doctor uses a closure device, he or she will apply a sterile dressing to the site. If manual pressure is used, the doctor (or an assistant) will hold pressure on the insertion site so that a clot will form. Once the bleeding has stopped, a very tight bandage will be placed on the site. Your doctor may decide not to remove the sheath, or introducer, from the insertion site for about 4 to 6 hours. This allows the effects of blood-thinning medicine to wear off. You will need to lie flat during this time. If you become uncomfortable in this position, your nurse may give you medicine to make you more comfortable. Next, you will be taken to the recovery area. NOTE: If the insertion was in the groin, you will not be allowed to bend your leg for several hours. To help you remember to keep your leg straight, the knee of the affected leg may be covered with a sheet and the ends tucked under the mattress on both sides of the bed to form a type of loose restraint. What happens after a valvuloplasty? After the procedure, you may be taken to the recovery room for observation or returned to your hospital room. You will remain flat in bed for several hours after the procedure. A nurse will monitor your vital signs, the insertion site, and circulation and sensation in the affected leg or arm. Tell your nurse right away if you feel any chest pain or tightness, or any other pain, as well as any feelings of warmth, bleeding, or pain at the insertion site in your leg or arm. Bed rest may vary from 2 to 6 hours depending on your specific condition. If your doctor placed a closure device, your bed rest may be of shorter duration. In some cases, the sheath or introducer may be left in the insertion site. If so, your period of bed rest will be longer. After the sheath is removed, you may be given a light meal. You may be given medicine for pain or discomfort related to the insertion site or having to lie flat and still for a prolonged period. You may feel the urge to urinate often because of the effects of the contrast dye and increased fluids. You will need to use a bedpan or urinal while on bed rest so that you don't bend your affected leg or arm. You may resume your usual diet after the procedure, unless your doctor decides otherwise. After the specified period of bed rest, you may get out of bed. The nurse will help you the first time you get up, and may check your blood pressure while you are lying in bed, sitting, and standing. Move slowly when getting up from the bed to avoid any dizziness from the long period of bed rest. You will most likely spend the night in the hospital after your procedure. Depending on your condition and the results of your procedure, your stay may be longer. You will receive detailed instructions for your discharge and recovery period. Once at home, watch the insertion site for bleeding, unusual pain, swelling, and discoloration or temperature change at or near the injection site. A small bruise is normal. If you notice a constant or large amount of blood at the site that cannot be contained with a small dressing, call your doctor. If your doctor used a closure device for your insertion site, you will be given specific information about how to take care of the insertion site. There will be a small knot, or lump, under the skin at the injection site. This is normal. The knot should gradually disappear over a few weeks. Your doctor may advise you not to participate in any strenuous activities. Your doctor will tell you when you can return to work and resume normal activities.